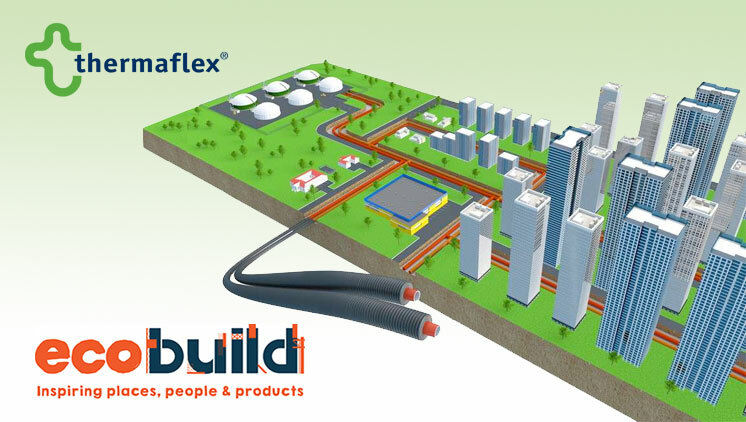 PBPSA member Thermaflex exhibited at Ecobuild 2017, and along with its certified business partner in the UK, Flexenergy made a presentation at the District Energy Town Square seminar which ran over the three days of the event. The ukDEA (UK District Energy Association) together with Heat Networks Sustainability by Sweden and the Embassy of Denmark collaborated to present the largest dedicated District Energy exhibition ever held, at Ecobuild 2017 at Excel London between March 7th and 9th. Thermaflex and Flexenergy presented in the Local Authorities Seminar on Wednesday, March 8th. Prefabricated district energy networks to minimize risks and reduce installation time. The presentation given by Thomas van den Groenendaal explained how Flexalen pre-insulated Polybutene-1 pipes with Flexalinks are being used effectively in the rapid installation process for new district energy networks designed to capture and utilise the residual heat output from local industry sources, delivering significant reductions in installation costs, heating costs and CO2 emissions. He explained how it is possible to open an entire city street, dig trenches, lay pipes, make house connections to the district energy network and then close the street – in ONE day. The Thermaflex seminar explained how it can be achieved and more information can be found on the Thermaflex website. The video below provides an overview of the subjects to discussed. Whatever your interest in relation to district heating or cooling networks Ecobuild is an excellent event to connect with industry experts and discover more about this rapidly growing sector. Thermaflex looks forward to meeting new contacts at the next Ecobuild event.